Today was my first day with my new employer Jimdo. For the last nine years I worked with it-agile in different positions, the last three years as a coach/consultant and trainer for Kanban. I‘ve learned so much during this time and and got to know so many different companies - small startups and agencies as well as medium sized companies and some large multinational corporations. I still think it-agile is one of the coolest companies on the planet, and I am really grateful to my colleagues, especially Henning and my brother Stefan. And if you are into Agile and like to coach and train people, I strongly recommend that you consider applying for a job there! So why did I decide to leave it-agile then? As you can imagine, it was a very tough decision. The main reason is: I am really curious what it feels like to go to the "other side of the fence" and work with a product company long term. For me, one of the biggest upsides of working as a consultant can also be a big downside: You see a lot of different organizations and talk to so many interesting people. At the same time chances are that you leave an organization and start a new engagement when the first steps are taken (and starts becoming really interesting). And even if you are involved for a longer period of time, you will always stay an outsider - you can participate in the successes of your client, but still you are always the external consultant. So I decided that it‘s time for me to move on and start a new career as an embedded person in a product company. Why Jimdo? I first met the Jimdo guys back in 2010. Since then we always stayed in touch and one day they asked me to do some coaching with them. So they have been my client for the last three years, and many Jimdudes became my friends quite quickly. When I first visited their office, I felt immediately that this company is special, and there were so many situations where this impression was renewed. Here are just a few examples: Having a Feelgood Manager (watch this video about Feelgood Management (German)), an architect (and I am not talking about a software architect here) and a chef working at Jimdo; a napping room and a fancy aquarium room everyone can use when he/she needs to rest; no time tracking; really self-organized and empowered teams etc. What will I do at Jimdo? Here you can see a clipping from my contract of labor. 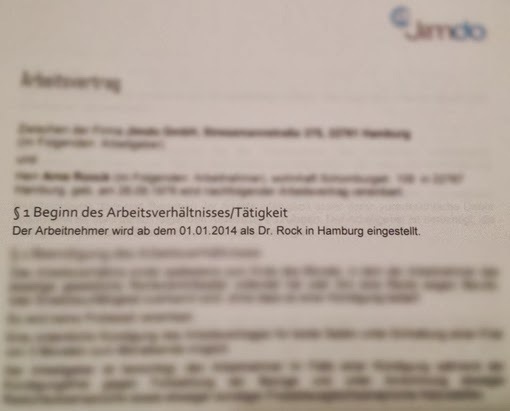 For those of you who don‘t understand German: It says that I will be employed in my role as "Dr. Rock" from January 2014 on. What does it mean to work as "Dr. Rock?" I don‘t know exactly, and neither do the founders who hired me:-) The important thing for both parties was that we wanted to work with each other and that there was a huge amount of mutual trust. So we decided to sign the contract and figure out later what exactly my tasks would be. Now you might understand why I wrote that Jimdo is special. And what did I do on my first day? Started my two day internship at the awesome support team. And as expected, I learned really much about our customers! Wish you all the best and a good start!